Please note: the upper is waterproof but the construction of the boot is only water-resistant. Love the shoe. Got lots of compliments. The light color seemed to work with everything i wore...including dresses with tights! Bought them to wear in mountain town and rain. Warm and comfy! Every time I wear, these, someone compliments me and asks for specifics, “who makes them?” and “where did you get them?” And the best part is they are super comfortable. Beautiful and waterproof. I had to size up a whole size on this style because quite narrow in toe area. I wear with thick socks. I have this in the light and black options and may buy a third in the lighter brown shade. Very nice in person. If you have narrow feet get your actual size. If you need room in the toe area size up a whole size. So comfy. I get lots of compliments. I love these boots. I love the color, the quality of the materials, the way they fit, and the perfectly gorgeous design. I wore them during some travel last week and got compliments from women all across the country. I have a fur-hooded down coat that is exactly the same color and with black leggings and a black cashmere turtleneck I was the most comfortable person on every flight. Just great boots. Comfortable and warm nice that they are waterproof as well! These booties are comfortable and stylish. I have worn them all over Europe. Love them!!! Hold up when life happens! Love them! Totally stayed waterproof when my basement flooded. My kids told me they were too fashionable to wear to muck in and play with the dog but life happens and these are so freaking comfy and waterproof! Love them! THE best boot I've ever bought. I'm so in love with these shoes. I wear them everywhere I go now!!! The only problem is is that since they are light, smudges are shown more prominently and it is harder to clean. Luckily, I have Cole Haan's leather/suede cleaner, I got most of the dirt off, but clean with a VERY light hand!!! But overall, I've gotten SO many compliments in just 2 days of wearing them!!!! I'm going to get them in different colors soon!! Very nice shoes, comfortable and warm. But very disappointed with the color, cause I ordered online and here it is milky white, but in reality it is dirty grayish..
Bought these for a recent trip to Scotland. I wore these 95% of the time. We hiked in the highlands, rain and mud. My feet were dry the whole time. The best part for me was a quick rinse and they cleaned right up! Still look great after the trip too! These are very lightweight and comfortable. They are a light grey color, rather than the pink-ish they appear in some photos. The color is more in line with the video, which is what we wanted and is perfect. Love them. Fit true, are comfortable and stylish! Love these! Exactly the winter boot I was looking for. Cute and very comfy and keep my feet warm and dry. Fit me perfectly too with room for heavy socks if needed. Loved them so much I bought in both colors! The best fashionable all weather boots I have ever owned! It’s incredibly light weight and super comfortable! The best match to any occasion! Product was good but to narrow and runs small for my wife! 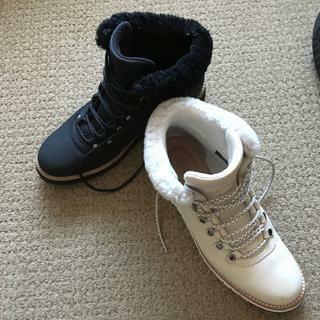 Got boots in the winter white color and just wore for the first time after a small snowfall. Kept my feet dry and were comfortable although a little bit stiff around the top part of boot. Got compliments galore. Not your typical heavy, dark colored snow boot. So because I couldn't decide what color to take. I got two, one in stone color and another in black. Love them both very much. So comfy and warm. And so easy to clean. At first i ordered half size bigger thinking I'll need extra room for thicker socks, but end up exchanging to my true size. Great looking boots - narrow toe box. I absolutely love the look of these boots and the color - however being a true "B" width, these boots were narrow in the toe box. For this reason, I would suggest a 1/2 size up and also - if you have wider than a B width foot, please consider another boot. Love this comfortable, cozy & cute boot. Works well with jeans and leggings. Couldn't afford the coat, but love the shoe!!! Have these in black as well. Look just as cute in person and fit great! Never disappointed by Cole Haan. Love the color, leather texture and comfortable fit. Plus, waterproof!! Beautiful soft leather. I weather treated them and they have stayed clean and the dirt marks just wipe off. There is a leather footbed sewn to the heel sole and there is a seam on the lateral side of the footbed that I can feel when standing. It’s not uncomfortable but noticeable. May be important to some people. They are a great fitting shoe with timeless style and finish. I think they run true to size, I ordered both 81/2 and 9, and kept the 8 1/2 which is my usual size. Very comfortable with no break in time. nice boots. look and feel great. receive lots of compliments on them. Perfect winter white color. Very warm & durable while keeping feet dry! Also great for everyday use in the winter or even casual use with jeans or legging! These boots are even cuter in person. I can't wait to get some wear out of them over the holidays! The color is so pretty, and they are seriously so cute. I sized down half a size, and they are perfect (10-9.5) Can't recommend them enough! I love these boots! So comfortable and look great. These boots are lightweight, so comfortable and cute!!! I know I will enjoy them all winter. They are more like wearing sneakers. Great looking and really comfortable. Not sure how clean they'll stay! I purchased the pumice stone color. These boots are a perfect fit. Light weight, solid and stylish. I plan to get a lot of wear out of these boots this winter. These are just the best boots ever! They look amazing and feel amazing! I liked the design and I thought the boot looked warm and practical. I have Zerogrand sneakers and LOVE them, so decided to try the boots! My daughter wanted this stylish boot because she just moved to Pittsburgh from Charlotte. My daughter saw them in a window in NYC and requested them for Christmas. Cole Haan products fit my foot perfectly. Great to see a light colored boot. It looks stylish and seems like would have good traction. It doesn't look like it will be heavy. Waterproof warm and good fit. love the color, fur. sole looks fun and comfy. My daughter just bought the same pair. These are super cute! Can't wait. Love these hiker boots. Super comfortable, warm and they look beautiful with anything. These hiking boots are getting rave reviews and they will be a perfect Christmas present for my girlfriend. My girlfriend loves them and I love her. For winter boots that are cute. These boots look warm and attractive. They also look comfortable and hopefully as with previous purchases they will be loved and used. color. its perfect for winter. I liked the colour and style, and have had great experiences with Zero Grande. I also read the reviews and was confident these boots would be warm and water proof! a pair of boots that's very stylish. They are a nice looking, casual winter boot that will look great with a variety of outfits. They also come in wide width which is not typical for this type of shoe. They are functional and cute! My wife and i like to look and as a owner of CH shoes i know they make a good product. I saw a lady with these on at the mall and they were super cute. I had to have them! Reviews, Color, Style and waterproof. It is just an absolute cute lightweight hiking boot. These are the best boots I have ever owned. They are stylish and supremely functional in WI weather. Love, love, love them! Style meets function ! Pretty and functional! Color combo and fur. Make this for men! The Grand product line is always light and comfortable. I like the style of the boots, there is nothing else like it. It was on girlfriend's Christmas list. Wife spotted them in a store window whilst walking around Manhattan over Thanksgiving. She loved them at first sight! BEST ANSWER: Weight will vary slightly by shoe size. For example, Grand Explore Hiker in size 6 weighs .75 pounds per boot. BEST ANSWER: Never wear them outside. Nubuck, like suede, is a delicate material and should be worn with care. Use a suede bar and/or brush with a light hand to remove or minimize light, dry surface soil. Take care to avoid wearing Nubuck in wet conditions. A light application of suede protector applied according to manufacturer directions will offer some protection from light surface soil. These boots are marketed as waterproof, yet you're telling us not to wear them in wet conditions? That seems to defeat the purpose. These boots are advertised as waterproof. So why are you saying "avoid in wet conditions"??? I sprayed mine with leather protector before wearing them. That is a good question. I would also like to know. I know my Cole Haan shoe size when I don't wear socks but would you recommend ordering a half size larger since these boots would be worn with socks (or does the boot have extra space built in automatically for socks)? BEST ANSWER: You should choose a shoe based upon the fit of the shape of your foot while wearing the appropriate hosiery. If this boot fits snugly with a standard, cotton sport sock, it's too small.- could be the overall shape of the boot or it could be the width. Try ordering two sizes and returning one. Remember, ordering a half size larger will make the boot longer - not wider. I got a smudge on my pumice stone boots- what’s the best way to clean them? BEST ANSWER: We like Lisa & Kristal's suggestions! White leather is delicate and can be tricky, so you should use a light hand when trying to remove marks. You might also try Magic Eraser - sparingly. Good luck! I find it works best with soda water and a new soft micro cloth. Potentially add a few drops of liquid detergent. Good luck! Will the rain or snow stain the grand explore boot? Do i need to spray them with a protector? I sprayed mine just for extra protection because I knew I was going to be walking through snow with them, and they held up perfectly. BEST ANSWER: I would say not at all. While comfortable they aren’t very structured and the outsole has no grip. The only way they would be ok is maybe a paved trail. Not so heavy as regular hiking boots , but so light soft and confortable . No, you need something made for hiking Patagonia. These are called hiker boots for the style not use. Hiking on 5 th Ave, NYC, maybe...not the mountains. Will this be good to use on icy road during winter? Is there a traction under outer sole? BEST ANSWER: I have these boots & have worn them on icy ground & they do work great with traction! How much warmer are these than the zerogrand waterproof hiker boot? BEST ANSWER: While we don't rate for temperature, we can tell you that the both have fabric linings and both are great choices for the fall/winter seasons! The GrandExplore has a gusset tongue and is slightly taller than the ZeroGrand. This provides a tighter fit and more coverage around foot and ankle. Add a boot sock for extra warmth and you will enjoy the season in good style! Will these be back or are they gone forever? BEST ANSWER: The GrandExplore Waterproof Hiker Boot was a limited production style for us. If it is sold out in your size at our website, try an online search to find possible availability at our retail partner stores. Use quotation marks: "Cole Haan Women's GrandExplore Waterproof Hiker". How do you clean the white rubber at the sides of the shoe? BEST ANSWER: We recommend using our Grand Sole cleaner which is specifically designed to clean the soles and edges of rubberized footwear. Packaged in an easy to control fingertip pump spray, the product will help clean both oil-based and water-based stains. will these be restocked anytime soon??? BEST ANSWER: The GrandExplore Waterproof Hiker Boot is a limited production style and no longer available from us. However, try an online search to find availability at our retail partner stores. Use quotation marks: "Cole Haan GrandExplore Waterproof Hiker". Is that fur on the upper lining of the boot? BEST ANSWER: The collar of this boot is padded with shearling which is wool - not fur. Do these boots stretch or “break in” with wear? BEST ANSWER: I have had my boots for over a year and they have not really stretched at all. 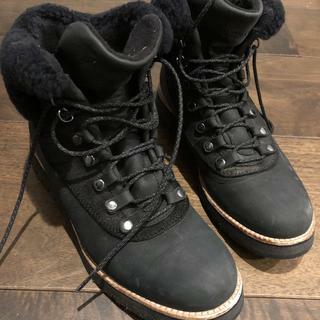 Now granted, I only wear them during the winter, so they are not worn a ton, but even today I would describe them as having the original shape. I am sure if I wore them more they would probably stretch a little. They are super cute and worth the purchase! They do but not much. I love these boots! So comfortable and warm. BEST ANSWER: If you take a look at the thumbnail pictures on the product page, you will see the textured sole on this Hiker boot which provides good grip on hard, dry surfaces. BEST ANSWER: The tongue on the Women's Millbridge Waterproof Lace Up Boot is gusseted, which should keep out rain and snow. BEST ANSWER: We will price match a major retailer's price if the exact same style and size is currently available at www.colehaan.com. We do not match prices offered by discount retailers. Can you wear these in the snow? BEST ANSWER: This is an Alpine-inspired Hiker boot. The leather is water-resistant and the sole is textured, so walking on hard-pack snow should be a cinch. Does this come with extra laces? BEST ANSWER: This boot comes with one pair of laces - all laced up and ready to go!